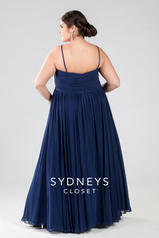 SC7071 Look glamorous at any special occasion wearing our best-selling chiffon formal evening gown. Flattering Empire waistline. Butterfly bodice features soft pleats and spaghetti straps. Burst of rhinestones adds sparkle to your big night. Lightly gathered A-line skirt flows in a smooth circle when you walk or dance. Matching chiffon shawl included. Our Starburst dress comes in eight stunning colors. There's sure to be one you love!